You've said that each visportal belonging to the visleaf the player is currently in and which is in his field of view is automatically open. This is not exact. 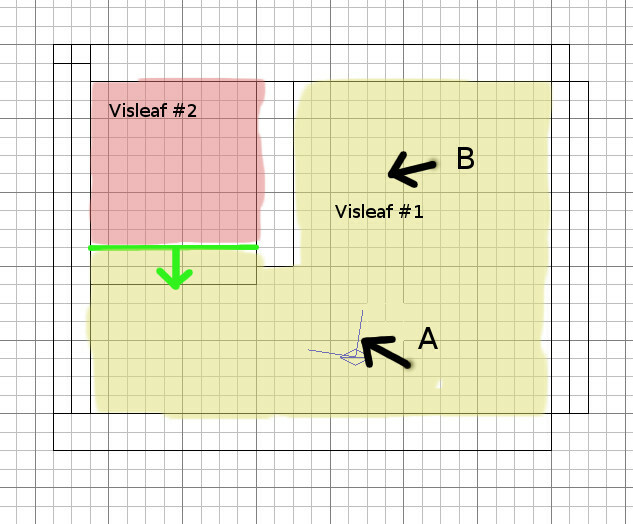 The visportal is only open if the side of the current visleaf is facing the player. Could you explain that one further? I'm not quite sure what you mean. I'll try. Each visportal actually has two sides, each facing into one of the both visleafs the visportal is connecting. I've created an example setup. The green line is the visportal, connecting the visleafs #1 and #2 (marked in different colours). 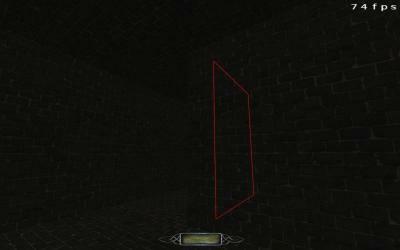 The player is in the first visleaf. The green arrow illustrates the normal vector of the visportal facing into visleaf #1. The one towards the other visleaf points exactly into the opposite direction, but that is not important here. 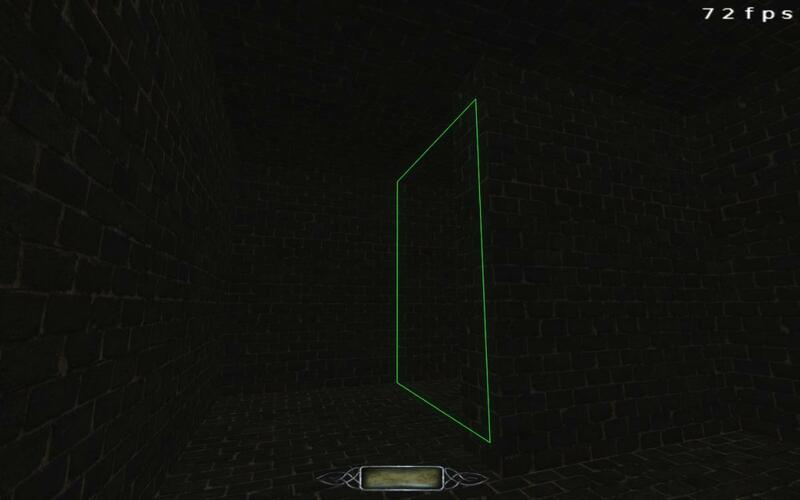 If the player stands at position A, he is staring directly at the side of the visportal facing the visleaf he is currently in, causing it to be open. If the player stands at position B, he is still staring at the visportal, but this time at the side that is facing into the other visleaf. In this case the visportal stays closed. Regarding the math. I didn't look it up in the code but if you have the normal vectors of the visportals facing into your current visleaf, you can find out which situation is the case by checking whether the angle of the players viewing direction and the visportal normal exceeds then 90 degrees. Only in that case it should be open. This is the same math the trigger look script uses, which I'd explained I while ago. Also, you will get a lot of value out of watching the videos on using modules (or at least the first one). Getting "webpage not found" when clicking on link to prefabs download. Link incorrectly points to "prefab" but it should be "prefabs"
Edited by marcuskiwi, 03 July 2017 - 01:43 AM. There is a 's' missing after prefab, a typo in the link. @Springs: On my end there are black bars around the video, so it isn't using the full size of the screen. If the video looks like this is there a way to get rid of it? A few things I noticed, while watching: for resizing brushes, you keep saying to right-click next to the brush. This should be a left click. Regarding navigation in camera view: When you have clicked the right mouse button and are able to look around, you can also use the arrow keys on your keyboard to navigate. This also allows you to strave right and left and has a more fluent movement forward and backward than the mouse wheel. Finally: For a German keyboard the console is called not with ctrl+alt+tilde, but ctrl+alt+circumflex (in each case it should be the key left of the number "1" key). Alos, I have added the video to the tutorials list on the Wiki. Edited by Destined, 03 July 2017 - 05:26 AM. I added an "s" last night, but I see that only updated the text, not the actual link. Fixed now. I've tried to figure out why that's happening. It didn't for any of the other video series I've done and as far as I know I'm not doing anything differently. Oh, I see the display ratio was somehow changed during import. A few things I noticed, while watching: for resizing brushes, you keep saying to right-click next to the brush. This should be a left click. Thanks for mentioning that; I will re-upload after fixing that issue. Already fixed at the source. I've uploaded a revised version. Hey Spring, which version of DR you are using? I'm using DR 2.2.1 on Linux and there is no "Window Layout" entry in the view menu. It should be there, shouldn't it? Huh, I'm using the same version but on Windows. Maybe the Linux version doesn't have that option....? Edited by marcuskiwi, 03 July 2017 - 11:07 PM. Its like all the textures are hidden? Edited by DoubleOhZero, 04 July 2017 - 03:56 AM. This sounds like DR is not set up correctly and thus cannot find the textures. Does your Engine path (when selecting File->Select Game...) point to your "The Dark Mod" folder (where the "TheDarkMod.exe" and all the pk4 files are stored)? The path to fms/"Yourmap" goes in the line "Mod (fs_game)". 1. Download the prefabs.zip file. 2. Extract it into your main "darkmod" folder. 3. Set the "Engine Path" in Dark Radiant to your "darkmod" folder path. Make sure you are using the most current version of TDM, and that your Engine Path in DR is set correctly, as Destined mentioned. Let me know if this doesn't fix the problems. There's a bug in the Linux version of 2.2.1, some menu items are missing, and things like the most-recently-used map file list gets borked after use. I've fixed this in most recent Git though. It's possible to assign a key combination to the command changing the Window Layout, look for "ActivateLayoutEmbedded" in the Edit > Keyboard shortcuts dialog. You might want to add these links to the OP. Thanks all, the paths were set wrong. Working now! Thanks for the tip greebo! I didn't know there were keyboard shortcuts to change the window layout. I also assigned a hotkey to the readable editor, whose menu entry is also missing. As someone who has never tried a 3D graphics program before I have to follow the video step by step and its ok saying use something else but why should I have to ask for help when the prefab should be there in the first place if that is what the video says to use!!! If I am expected to find my own way around then I might just as well give it away now before I get too deep into it. That's why I posted the alternative: so you can further follow the video. I cannot talk for Springheel, but he may just have forgotten to include this prefab into the zip-file he provided. Don't be discouraged by minor bumps. The videos so far have been a very good introduction (at least in my opinion), but Springheel is still just human, so some mistakes are bound to happen. If you find a problem or a mistake, just post it here and we will find a solution (after all, this is what the forum is for). And without wanting to discourage you: I am quite sure you will spend quite some time finding your way around, looking for models, prefabs and entities you want to use, until you have a feeling about where to find them. I know time is precious, but you will have to invest some, if you want to create a map.